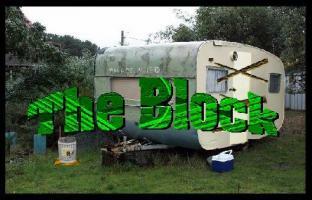 Welcome to The Block* where nothing is as it seems. Feel free to beat around the bush, discover the secrets of mysterious kitsch, explore a dilapidated old caravan, revel in the vague plotline and collect treasures along the way to win the game. For those bamboozled by Chalkman, play this one instead. Originally developed with AGS 2.07 sometime at the turn of the millennium, this is the remake using AGS 3.2.1. Enjoy! Note: * The name is in no way related to the reality series of the same title that first appeared on Australian TV years after this game was originally conceived. For those not familiar with this inane show, consider yourselves lucky. Jazz is the defining word for this game and perhaps without the music it would not be easy to find it. It reminded me of Myst - the game and of Beasts of the Southern Wilderness - the movie. The use of photos for backgrounds and items works by allowing a fresh and rough look at things which fits the outdoors setting. I felt that the photos should not have been mixed with drawings( e.g. the golden key and the spider ). The puzzles may seem unsettling at times( e.g. breaking a window )since there is no story to motivate your actions, at least initially. This is how the game looks after only a few minutes of play. You should give it a try ! This was a good game even though it was a little hard to figure out what to do next in it at some points in the game.